Published 2018, Journal of Molluscan Studies, early online edition. Click here for electronic access. Abstract. The Indotropical freshwater mussel assemblage has more genera of uncertain subfamily-level position (i.e. genera incertae sedis) than all other regional faunas. Of the 16 genera incertae sedis in the Indotropics, only two, Harmandia and Unionetta, are distributed in the mainland southeast Asia subregion. Resolving the enigmatic systematic position of Harmandia and Unionetta would finally establish a complete subfamily-level classification for the freshwater mussel genera of southeast Asia and facilitate more comprehensive evaluation of regional freshwater mussel diversity and distribution. Molecular phylogenetic reconstructions using the nuclear–encoded large ribosomal subunit rRNA (28S) and the mitochondrial protein-coding cytochrome c oxidase subunit I (COI) recovered Harmandia and Unionetta in the Indo-Afrotropical subfamily Parreysiinae, and more specifically as members of the tribe Indochinellini (formerly Oxynaiini). Harmandia is shown to be polyphyletic with its former species belonging to three distantly related clades of the Unionoida (i.e. Parreysiinae, Rectidentinae and Hyriidae). Unionetta was likewise not recovered as monophyletic, despite the strong morphological similarities and close geographic proximity of the sequenced individuals. Based on a synthesis of molecular, morphological and biogeographic data, the taxonomy and geographic distributions of Harmandia and Unionetta are revised. These results are discussed in the context of the dispersal of the Parreyssiinae into Southeast Asia and the species-level diversity of the Indochinellini in the Mekong River. Abstract. 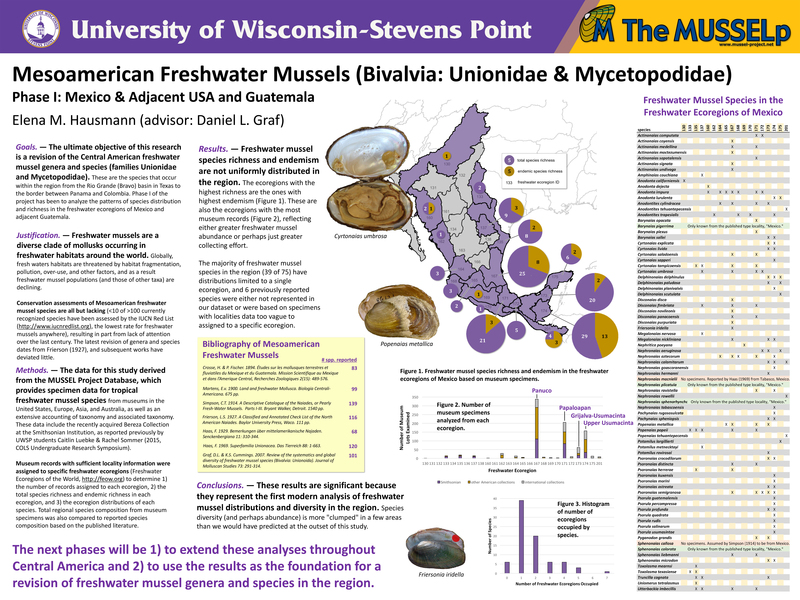 Mesoamerica is a global hotspot of freshwater mussel (Unionida) diversity. However, the mussel fauna of Central America and México is poorly known and is badly in need of revision. The last comprehensive treatments of the fauna were made by Fischer & Crosse (1870-1902) and von Martens (1890-1901). Frierson (1927) provided a checklist of species from México and placed many of the species in the genera of Crosse & Fischer without comment. The Mussel Project (MUSSELp, 2018) currently lists 75 species from México as valid. We conducted fieldwork in the Río Pánuco in San Luis Potosí, and the Río Conchos (Río Grande del Norte basin in Chihuahua) and examined 1393 total lots (including types) from 16 museum collections collected from México and the Grijalva - Usumacinta basin of México and Guatemala. As a result, we now recognize 58 species of freshwater mussels (51 Unionidae and 7 Mycetopodidae) from México and boundary waters as valid. The basins with the greatest species richness are the Pánuco (14), Grande del Norte (17), and Usumacinta (20). Historically, members of the Unionidae in Central America have been classified with the Nearctic lineages, especially the Ambleminae. Mycetopodids are otherwise endemic to South America (Ortmann, 1921; Frierson, 1927). With the exception of a few species, the Mesoamerican assemblage is distinct from that of North America (only 9 species are shared between them) and consists of a large number of endemic species, making it a transition zone between Nearctic and Neotropic faunas. 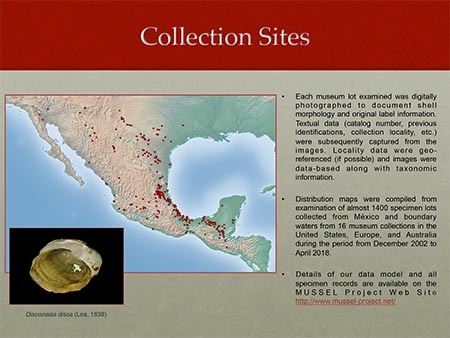 This slide shows distribution of museum lots from Mexico in the MUSSELpdb.